A 150-m-long mineralized lamprophyre dyke intrudes mylonite-mélange at the eastern side of Wadi Sikait and granite at its western side. Its petrographic, mineral, and geochemical characteristics were investigated in order to determine its genetic history as well as the petrogensis of the hosted mineralizations. Rocks of the Sikait lamprophyre dyke have a porphyritic and, less commonly, aphanitic texture. They consist of REEs-U-Th- and Nb, Ta-bearing minerals in addition to Au and native nickel, zircon, and fluorite. The ratios of LREEs to each of the HREEs, MREEs, and HFSE are relatively high. The U and Th contents in the part of the dyke existing in granite are slightly high than those in that hosted by the mylonite-mélange. The Sikait lamprophyre dyke has a calc-alkaline affinity and metaluminous to peraluminous. Its parent melts were derived from a mantle metasomatised by carbonatitic fluids. The protolith was subjected to slight to moderate partial melting in shallow to intermediate depths. During the emplacement of the dyke, U was released from its mineral precursors, transported, and redeposited under favorable condition. Its concentration in the part of the dyke hosted by granite was increased by the action of young surficial processes. On the other hand, Au was derived from the ophiolitic metagabbros and serpentinites that over thursted on the mylonites. It was precipitated from mesothermal and epithermal solutions. The Sikait dyke was affected by several alteration processes; the most common of which is hematitization and metasomatic carbonatization. The online version of this article ( https://doi.org/10.1007/s12517-019-4394-0) contains supplementary material, which is available to authorized users. 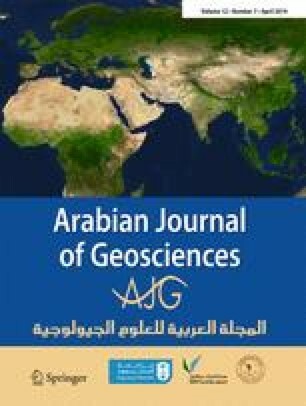 I would like to express my appreciation to prof. Mohammed El Ahmady Ibrahim for suggesting the research point, collecting samples during the field work, and invaluable comments that helped to improve the quality of this paper. Also, I would like to express appreciation to Prof. Mohammed Abu Zeid, professor of sedimentology, Ain Shams University, for his valuable comments.